The last of the big hitters left in Soho and possibly the largest 'spoon' left in London. Wall-to-wall yellow Formica and lots of brilliant red booth seating make this one of Europe's finest eateries. 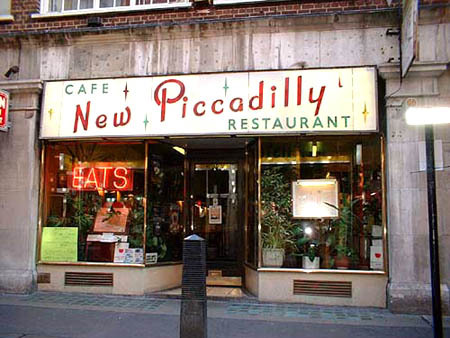 Quite apart from the breathtakingly well preserved interior, the New Piccadilly menu itself is a collectors item design classic. A cathederal amongst caffs and as such be advised that this is a place of reverence and high sanctimony, So leave your combats, style-wanker trainers and TinTin fraggle crop at the door. We'll have no trouble here! Read the 'Independent on Sunday' interview with proprietor Lorenzo Marioni. Along with L Rodi E17 (below) and The Koffi Pot, Welling (also below), The Gambardella (Vanbrugh Park, E3) is the most exciting classic cafe find this year. Run by the same family right from its opening day over a half-century ago, this is possibly the most hidden cafe gem in all of London ­ lost in the Blackheath Standard area at the top of Greenwich Park. (The only way to get there is via a circuitous bus route from Greenwich town centre). The building dates from the 1930s, but the unique moulded plywood revolving chairs were installed during the 1960s. The two sections of the cafe form an entire history of the genre: the front room is early 20th Century deco with amazing flesh-coloured Vitrolite and chrome; the back section is mid-century Festival of Britain in red and black Formica. And don't miss the silver deco clock, the tile-floor parlour, the 100 year old fridge and the nifty old wall heaters. A masterpiece. L. Rodi's is a splendid old caff that's been with the same family since 1925. The frontage is somewhat altered (thought the excellent 'L. Rodi Light Refreshment' sign is untouched) but the front room is a fantasy of marble-mint Formica set under sparkling Vitrolite; chrome edged tables are packed tight opposite an original counter with a giant old English Electric fridge at the back; the upper walls are lined with authentic 1950s tobacco posters. The back room is a veritable caff museum: lined with emerald and off-white tiles; Victorian marble tables; a working grandfather clock that still chimes the hours; black-lacquer bentwood coathangers; framed menus from the past and beaten-silver signs embossed with the words 'Teas' and 'Suppers'. The place has barely changed in a century. Overwhelming. Emotional. Essential. Only the stylish serif typeface above the door indicates anything special but special the Alpino most certainly is. Founded in 1959 this monument has held on to every ounce of its character. The interior is a wonderland of museum-quality tables and shiny, worn wooden booth seating. On top of this, the fluted beige wall panels, teak-veneer Formica, glossed-over 1950s anaglypta, red lino floor tiles, period wall heaters, glorious lamp fittings, coat-hangers and teak detailing make this a no holds barred Top Ten destination. Jeez, even the Alpino's plum-pattern plate n' saucer sets are ceramic perfection. Just ducky! Simon Cheung, the Alpino's owner, is a caff-master of the old school; a gent who really knows how to handle the old place to best effect. NB: For the flaneurs out there, this is a favoured Iain Sinclair stop-off on his Regent Canal walks. Magnificent upper & basement interior with splendid murals downstairs. Rosewood tables and seats and original milk bar-style serving counters. Good lights... Set behind Liverpool St station. Great outside sign. Lapidus beanpole rails also! The large amount of wood booth seating is inspirational and the scale somewhere near the best of the US diners like Dennys. The downstairs is even larger with chalet-style wall texturing and a weird geometric counter. Murals adorn the back alcove booths in the style of an alpine lodge! An absolute classic that must not be missed. More > interview with Mr Burkeman. Almost as turbid as the Clapton Ponds it stands next to, with its creaky double-fronted exterior and unremitting drab decor, this caff seems to be perpetually on its last legs. Orders are written in felt-tip pen on an ancient piece of plastic on the counter which is then wiped clean. 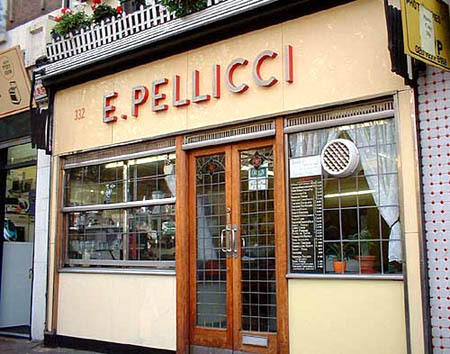 The cafe's run by the eponymous Don and his ancient Italian siblings (all of whom came from Lucca in the 1930s) and sits just around the corner from where Harold Pinter was born. Fans rave about the "wonderful physical space and decor, fine food and music... oh, the music!" Don's chirpy whistling (and the accompanying polka music) is a unique selling point along with the big fat caff cat: "Places like Don's offer something you can't get in your quotidian Costa Coffee: character. Okay, the food isn't up to the ludicrously high standard of Stateside equivalents like Tom's Restaurant in Brooklyn, but it's run by two tiny little fellas, both about 75 years old, who make great tea to a non-stop soundtrack of 1940s French accordion music. There's something terribly classy about it, even taking into account the nicotine-stained walls, ratty furniture and faintly grubby atmosphere." Almost next door to the Copper Grill. This narrow cafe has an unusual basement that has classic chalet-style decor throughout. Both upstairs and downstairs sections retain the original Swiss light fittings and snow cave wall texturing.The Piccolo and Copper Grill are like brother and sister. Voyage out to the rear of Liverpool St station and investigate them both. An oasis of leatherette sanity in an injection moulded wasteland! Good booths & lighting & sign. In a weird enclave - the garment district north of Oxford St. A great stomping ground for odd shops and lots of 50s buildings in the favoured municipal style. Particularly welcome also in that most of the surrounding eateries are so hideous. Excellent orange Formica Bedazzled int. with great booths in a hidden backstreet behind Holborn station near the Soane Museum. A great little hide-away street and always excellent service. 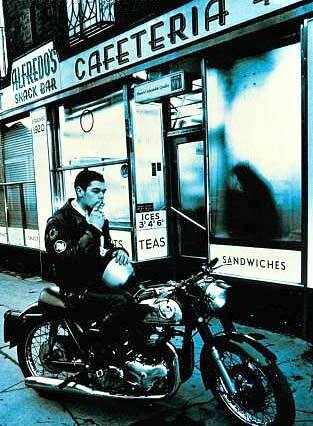 Sister cafe 'Bernis' around the corner now sadly defunct. A fine family establishment set at odd angles nestling in a superb little enclave. As of summer 2002, massacred internally, only the nice yellow sign survives. V. near 'Dante.' Good tables and seats and tea machine. w/ "cavern" section. Slight chalet-style - textured walls and cave-like hideaway booths. Cherishable. Well worth traveling for and quite near to the tube end of this market st. Superb interior with black and brown booths. Brilliant lights and loads of powder blue formica on the walls. Cut glass front door too. This fish an chip joint is a must-see.